When Toyota released the xB Scion, many old school folks were surprised at the success, but, with great lines, decent performance and a reasonable price, no one seems surprised at how popular the 2004-05 Scion tC is. The BORLA Rear Section for the 2.4L 4-cylinder Toyota engine (PN 11743) delivers a 200+ cfm increase in flow and better than a significant weight savings. The BORLA tC system incorporates 2.25” diameter lightweight yet durable aircraft-grade high quality austenitic stainless steel tubing with CNC mandrel bends and a straight-through free flowing wide oval muffler. It sounds awesome and is capped off with a stylish oversized BORLA embossed polished oval tip. Sound, performance and looks for the hot new 2004-05 Scion tC with an easy bolt-on installation. The advanced engineering BORLA incorporates into the Scion tC is based on a long history of Toyota exhaust from racing both cars and trucks. Current NHRA sports compact standouts Titan Motorsports rely on BORLA for their Toyota race and street car exhaust. 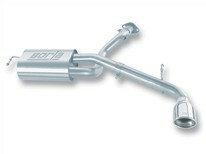 BORLA, your brand for 27 years building great sounding performance exhaust backed by an unbeatable million-mile warranty.